The Scottish Football Association will defend itself after Mike Ashley lodged a court challenge to its approval of Dave King's appointment at Rangers. Rangers shareholder Ashley has asked for a judicial review of the decision to pass King as a fit and proper person to join the Championship club's board. A case is due to be heard on 4 February after an initial date of 11 December was postponed. Ashley's petition will challenge the SFA's decision-making process. 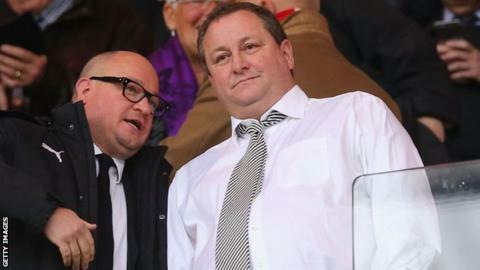 The Newcastle United and Sports Direct owner holds just under 9% of Rangers shares and his company has a retail agreement with the Glasgow club. Rangers' board has put forward a resolution to this month's annual meeting for the removal of voting rights of any shareholder involved in another football club. Meanwhile, Ashley has begun legal action against King over an alleged breach of an interim injunction. King was freed to take the chairman's role in May, having earlier led a successful bid to oust the club's previous board. The SFA had taken time to assess King's suitability given his tax convictions in South Africa. It consulted the relevant authorities in South Africa and Scotland, including the police, the South Africa Revenue Service and Her Majesty's Revenue and Customs, before allowing King to become chairman. "The Scottish FA can confirm we have received a petition for Judicial Review and will be defending it," the governing body said in a statement. "We will make no further comment at this stage."